The Quick Access Toolbar allows you to accomplish some tasks that are very frequently required by the user. 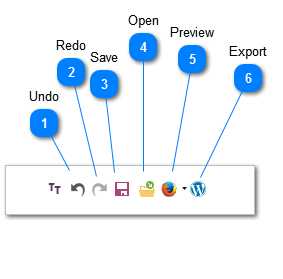 The options available in the toolbar are undo, redo, save, open, preview and export. Removes all the changes that you have made in the current working session. Restores the changes that have occurred since the last Undo. Saves the changes that you have made in the Theme/Template/Website under the (.ttr) file extension. Ctrl + s can be used for the same results. It is a shortcut to the save option in the file menu. Opens an existing (.ttr) file on your system. The open option is a shortcut to the Open Tab present in the File menu. The same task can also be performed through Ctrl + o. Gives a preview of the current Theme/Template/Website in the browser window. The preview option also facilitates you to select the browser you want to use for the preview by clicking on the small drop-down arrow. Provides the functionality to export the theme/template/website that you have designed using TemplateToaster. A detailed step by step information is present here.